Gestational diabetes mellitus (GDM) contributes to a number of complications during pregnancy, including preeclampsia, fetal hypoglycemia, excessive fetal weight gain, and numerous birth injuries. Despite these negative outcomes, consensus does not exist among experts regarding the value of routine screening for and treatment of GDM, especially when levels of maternal hyperglycemia fall into the range diagnostic of glucose intolerance and not overt diabetes. Data from several recent interventional studies demonstrate a clear and direct correlation between maternal hyperglycemia and negative pregnancy outcomes. These data may help build consensus and contribute to a change in both screening and treatment protocol for hyperglycemia during pregnancy. GDM affects approximately 4% of all pregnancies in the United States (about 135,000 cases annually), and the American Diabetes Association (ADA) defines it as “any degree of glucose intolerance with onset or first recognition during pregnancy.”1 The ADA recommends screening for GDM with a 50-g oral glucose challenge (a one-hour postchallenge plasma glucose level of greater than 130 mg/dL identifies about 90% of women with GDM) and diagnosing it with a 75- or 100-g oral glucose tolerance test (OGTT). Alternatively, clinicians may omit the initial screening and perform a single OGTT to diagnose GDM. A fasting plasma glucose level of greater than 126 mg/dL or a casual plasma glucose level of greater than 200 mg/dL, confirmed on subsequent days, meets the diagnostic criteria for overt diabetes and precludes the need for any oral glucose challenge. The U.S. Preventive Services Task Force, a panel of experts working with the U.S. Department of Health and Human Services who review scientific data and develop recommendations for clinical preventive services, does not recommend routine screening for GDM. In its 2008 statement, the task force cited a lack of sufficient evidence linking screening with improved outcomes in pregnancies affected by GDM.2 Although these experts recognized links between GDM and fetal macrosomia (defined by a birth weight of 4 kg or more), birth trauma, and Caesarean delivery, they questioned the relative contributions of hyperglycemia, maternal obesity, advanced maternal age, and caregiver bias (more Caesarean deliveries may be recommended to women with a GDM diagnosis than those without) to the frequency of these outcomes. They also noted that although excessive birth weight increases the risk of shoulder dystocia, only a fraction of deliveries complicated by shoulder dystocia result in birth trauma and, in most cases, such trauma does not result in permanent injury. In its 2008 statement, the task force recommended individual clinician discretion for the screening and treatment of GDM. • are not members of a high-risk ethnic/racial group (eg, Hispanic American, Native American, Asian American, African American, Pacific Islander). The results of three randomized interventional trials demonstrate improved pregnancy outcomes with routine screening for and treatment of GDM. The largest of these trials, the Hyperglycemia and Adverse Pregnancy Outcomes Study, reported in The New England Journal of Medicine in 2008, utilized data from 23,316 participants in nine countries to determine whether maternal hyperglycemia less severe than overt diabetes (ie, maternal glucose intolerance) negatively affects pregnancy outcomes. The outcomes tracked in this study are listed in the sidebar. Results indicate positive associations between levels of maternal hyperglycemia and all primary and secondary study outcomes, with the strongest associations occurring between levels of hyperglycemia, birth weight, and serum cord blood C-peptide levels (elevated C-peptide levels indicate fetal hyperinsulinemia). In fact, with increasing maternal glucose levels, the frequency of each primary outcome increased, although less so for neonatal hypoglycemia than for the other outcomes. These associations remained significant after adjusting for potential confounders (maternal weight and age, caregiver bias, and other medical complications). 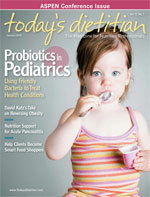 Two smaller studies, the Australian Carbohydrate Intolerance Study in Pregnant Women trial and a randomized trial funded by the National Institute of Child Health and Human Development, reported in The New England Journal of Medicine in 2005 and 2009, respectively, also demonstrated improved maternal and neonatal outcomes with screening for and treatment of GDM. In these studies (each with approximately 1,000 participants), significantly fewer infants in the groups treated for GDM were large for gestational age and significantly fewer had macrosomia. Maternal weight gain was lower in the treatment groups, and fewer women receiving treatment had preeclampsia. In addition, the women in the treatment groups made more visits to a medical clinic (prenatal) for diabetes education and treatment. However, in the Australian Carbohydrate Intolerance Study in Pregnant Women trial, these women also required fewer medical visits after their infants were born. Also noteworthy, Caesarean section rates were either the same between the study groups or lower in the groups of women treated for GDM. The three studies clearly demonstrate the benefits of screening for and treating GDM. Long-term benefits, if proven, may further bolster the argument for universal screening and treatment. Some studies suggest that infants with excessive neonatal fat mass or those who are large for gestational age are prone to developing impaired glucose tolerance, type 2 diabetes, and obesity later in life.4,5 Others have demonstrated increased risk of future GDM in girls born to mothers with GDM.6 If further research shows a clear connection between GDM and long-term negative health consequences, the decision to identify and treat GDM may no longer be a topic of debate. After all, the costs saved in preventing obesity and diabetes over decades far outweigh the costs incurred from treating GDM during the few months it affects a pregnancy. 1. American Diabetes Association Position Statement. Standards of medical care in diabetes—2008. Diabetes Care. 2008;31(Suppl 1):S12-S54. 2. U.S. Preventive Services Task Force. Screening for gestational diabetes mellitus: Recommendation statement. May 2008. Available at: http://www.ahrq.gov/clinic/uspstf08/gestdiab/gdrs.htm. Accessed November 7, 2009. 3. ACOG Practice Bulletin. Clinical management guidelines for obstetrician-gynecologists. Number 30, September 2001—gestational diabetes. Obstet Gynecol. 2001;98(3):525-538. 4. Silverman BL, Metzger BE, Cho NH, Loeb CA. Impaired glucose tolerance in adolescent offspring of diabetic mothers. Relationship to fetal hyperinsulinism. Diabetes Care. 1995;18(5):611-617. 5. Hillier TA, Pedula KL, Schmidt MM, et al. Childhood obesity and metabolic imprinting: The ongoing effects of maternal hyperglycemia. Diabetes Care. 2007;30(9):2287-2292. 6. Innes KE, Byers TE, Marshall JA, et al. Association of a woman’s own birth weight with subsequent risk for gestational diabetes. JAMA. 2002;287(19):2534-2541.